After what seemed like the shortest winter break of my life, I packed my bags and headed off for a whirlwind semester in Rome, Italy. After years of planning my studying abroad experience and telling everyone who cared to know (and probably people who didn’t), I was actually leaving to spend four whole months on a continent I’d never been to. Even for someone who had always wanted to travel the world, this concept terrified me. The first few days in Rome were an experience to say the least. My first night, there was a massive protest involving shooting flares which went on half of the night, and all I could think was “What did I just get myself into?” My second day in Rome, I failed so miserably trying to order turkey from the deli counter that I actually told myself I could never return to the InCoop store again. The Wi-Fi at my school never worked, Coca-Cola Light had to replace my beloved Diet Coke and the restaurants were charging me €4 just for a bottle of water. Everyone knows the saying, “When in Rome, do as the Romans do.” I can say without any doubt that I did not always do as the Romans did. I bought way too much peanut butter, ate way more than a small croissant for breakfast, and stayed out far too late on a Tuesday night to be acting like a true Roman. 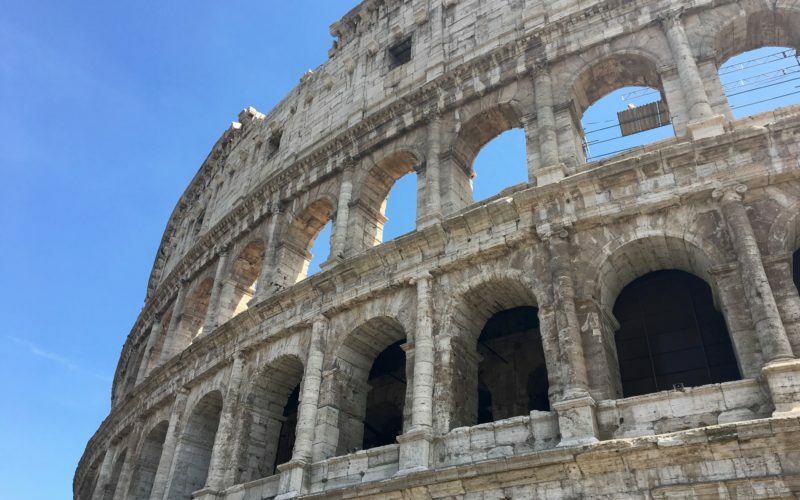 My blonde hair and lack of Italian language skills screamed “tourist,” I religiously walked 30 minutes to the one American bagel place in all of Rome, and I was less fashionably dressed than most 5-year-olds walking down the street. But in some ways, I’d like to think I did as the Romans do. I learned to survive without a microwave or a toaster (who knew you could do so much on the stove?). I learned very quickly that you have to weigh your fruit in the grocery store before going to the cash register or employees get super mad at you. I dealt with having to hang dry all of my clothes because dryers are super not a thing here in Europe. And I actually got used to walking past the Vatican or the Spanish Steps randomly on my way to other places. I’ve made friends with locals including my doorman, Sangi, and my crepe guy, Giulio (who generously gave me crepes on credit). I even have two gelato places that recognize me when I walk in and know my order. Above all, though, I did as a study abroad student would do, because at the end of the day that’s what I am. I went to 11 different countries and 22 different cities and I hit the major tourist sites everywhere. I posted cliché Instagrams at the most cliché spots in every city because why not? I’ve eaten way too much pasta, taken four different forms of transportation in less than six hours just because it was the cheapest way to get somewhere, and I’ve booked the majority of my flights through RyanAir or Vueling Airlines. I stayed at a random hostel in Barcelona because it was only €20 a night, ate tourist trap gelato because I needed it right then and there and I will swear until the day I die that Nutella is better in Europe. I’m doing my best to take everything in while fighting the panic that comes when I remember that I don’t have time to see it all. In a short time, being abroad taught me so much. I’ve learned to walk a little slower on the sidewalk because everyone here walks slowly, but hey, they’re still getting where they need to be. I’ve learned that pictures are amazing, but sometimes spending a few minutes just looking without your phone is more important. Memories last a lifetime. I’ve learned that things are going to go wrong, and I’m going to feel stupid sometimes. Sometimes you go the wrong way on the metro, or book Eiffel Tower tickets for the wrong day, or take the train 30 minutes past your stop and almost miss your tour. I’ve learned that most of the time it’s best to laugh it off. It’s all part of the experience, and those are the days that I’m going to remember in the end. So really, I’m just doing me over here in Rome. I’m making new friends. I’m seeing new places. And I’m definitely laughing more than ever. “Euro Ella” is thriving and loving every second of this adventure, and the odds of my cancelling my flight home get higher every day. Grazie per leggere! Ciao amici! Posted in Blogging, EuropeTagged italy, romecommentLeave a Comment on When in Roma!